They Came From Space is a cross-platform, up to 10-player, competitive team-based multiplayer VR game, inspired by the 1950s B-movie alien invasion films. Players are tossed against each other in the pursuit to destroy cities, collect energy to provide energy for your Mothership and eventually charge your laser and destroy your enemy's protective dome.. 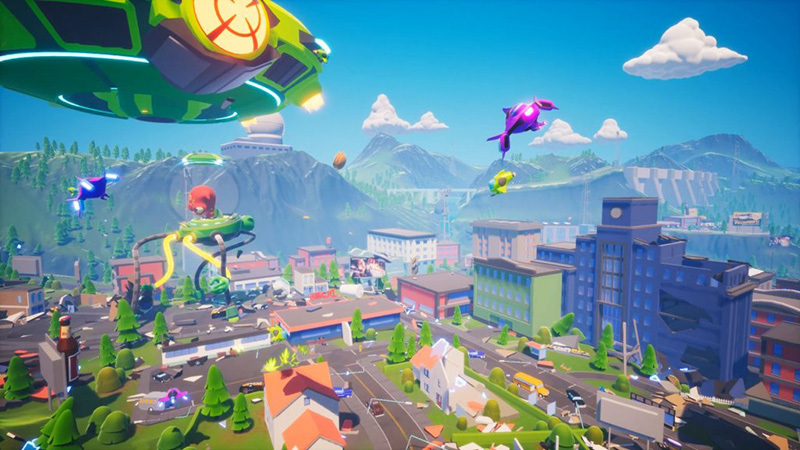 The game uses the same cloud-based physics technology that powers up Oculus Toybox and Crackdown 3. They Came From Space is VR (HTC Vive, Oculus Rift) and PC cross-play team-based action multiplayer VR game. Up to 5-player on each team are fighting against each other in a fully destructible and dynamic environment. The VR players play the Overseer and the PC players play as the pilots. 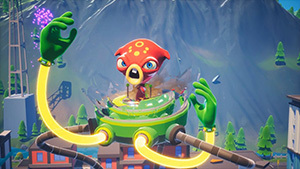 The Overseer is an enormous alien character and his role is to use his destructive powers to destroy the town around him using his powerful long arms. By doing so, the Overseer can obtain energy for the mothership, which once you have enough resources, you can charge up your laser and try to destroy the other's team Overseer by breaking his protective dome and then continue damaging it until it is defeated. If you play as the pilot, your goal is to help the Overseer obtaining energy to help him charge the laser. You also need to fly around the city and try to destroy the other team's enemy drones and steal the energy they have been gathering. The main highlight of this game is that is powered by Cloudgine's Cloud-Powered Physics. 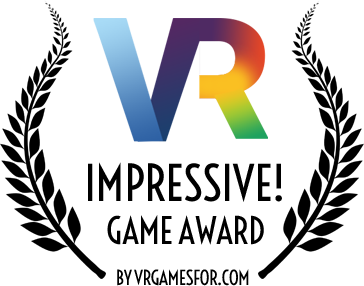 An innovative technology that allows developers to create groundbreaking online experiences for gaming and VR as well. So why cloud computing you ask? Well, almost all games' graphics capabilities are constricted to the built-in hardware they come with, including PC computers, consoles, and Mobile devices. Cloudgine uses the computational power of data centers from all around the world (also referred to as distributed computing) to push over those limits. Heavy computational tasks are offloaded to remote servers that deal with physics simulation, artificial intelligence, game logic. lighting, animation and audio processing among other things. This technology was used to power up the game Crackdown 3 and Toybox. All this allows developers to create VR and AR games and other types of VR experiences and deliver them in higher frame-rate, low-latency, and provide players with an overall better gameplay experience. 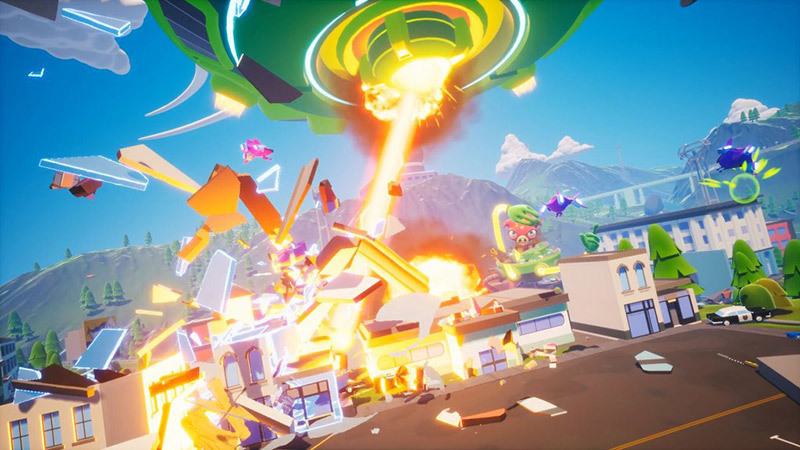 This advanced technology allowed Cloudgine to produce that fully physics-based destructible environment in They Came From Space VR game and make it run at high frame rates. I love playing in a destructible environment in games. I think the first time I really was impressed with destructible environments in a game is was in Battlefield 3 Close Quarters, which what DICE referred to as the 'Levolution' technology. The thing is when players destroy an environment, they actually changing the level landscape they play in. I remember playing Battlefield 3 Close Quarters and the map just changed completely. A beautiful peaceful place turned into a war totally wrecked CQC zone—it was an amazing gameplay experience. Of course putting all that destruction on a big scale map has a negative impact on the performance and the hardware requirement to run such games at high frame rate is higher compared to a static non-destructible world. This one of the areas where Couldgine excels in. Aside from this game helping Cloudgine market their advanced Cloud gaming platform, gamers can really get to enjoy a great gaming experience that probably wouldn't be available otherwise. I really the fact that They Came From Space supports PC / VR cross-play. Many multiplayer VR games are restricted to VR only players. This, of course, limits the player-base. It's great to see support for cross-play in this game. The game visuals are very detailed, vivid and cheerful. I like the cartoon-ish art-style choice and the Oversees character design that also gives the game its fine touch of comic temper. When I first saw the game's screenshots from the presskit, I thought I am looking at a new animation movie. I also later found and read that the game was inspired by the 1950s B-movie alien invasion films.. You can clearly see from the gameplay trailer that the developer paid a lot of attention to the details in the scene, by embedding lots of objects in the scene to make it very for players satisfying to destroy. My early impressions are very positive. I always enjoy reading about new technologies that help design better games. If you love online multiplayer team battle games and love just wreck things up in games, I think that They Came From Space definitely worth your attention. Other features include Streaming Director Cameras and Stream Chat in-game, which is needed to make the game more accessible and fun for streamers to stream and for viewers to watch. They Came From Space will support PC and VR headsets such as the Oculus Rift and HTC Vive. As of the time of writing, a release date is yet to be announced. Don't forget to check out the gameplay trailer to see what the fuss about a destructible environment is all about. For more information, you can visit the official website at theycamefrom.space.